Wow. 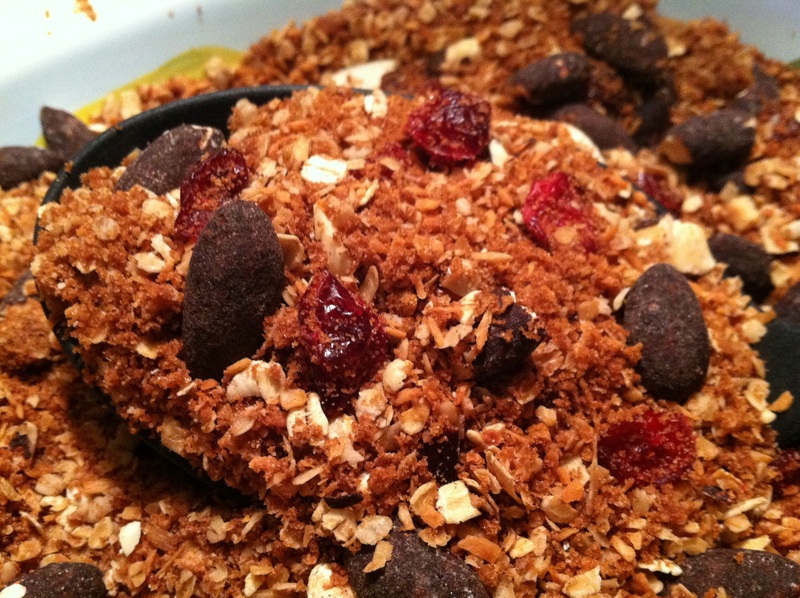 That is a mouthful – Chocolate Cherry Coconut Granola. A mouthful that you want to eat again. And again. And AGAIN! I love granola. Especially in my yogurt. It’s filling, it’s healthy, it reminds me of being a kid. What I don’t like? The high price to purchase it at the grocery store. Blech. I also don’t like having big chunks of the stuff to eat. It makes me feel like a hog shoveling a huge hunk of yogurt covered granola into my face in public. Plus, let’s face it. Your flavor options are limited when it comes to what’s out there. So I decided to concoct my own recipe. This yields a lot of granola, so feel free to cut the recipe in half if you don’t think you will eat it all. My recommendation is to make the whole batch and share it. I gave some to a couple of friends so they could try out the fabulousness that is this recipe. I think this will quickly become one of my favorites when whipping up a batch of granola. If you are fan of the chunks of granola clustered together, double the amount of oil in the recipe. Don’t have coconut oil on hand? Substitute olive oil, sunflower oil, whatever your heart desires. I chose coconut because it’s good for you and I have a tub on hand. Please just don’t use canola or vegetable oil. Are you a total chocoholic? I find the chocolate flavor of this to be just right for me with the combo of the cocoa powder and dark chocolate almonds, but if you want it REALLY chocolate laden then add another tablespoon of cocoa powder. 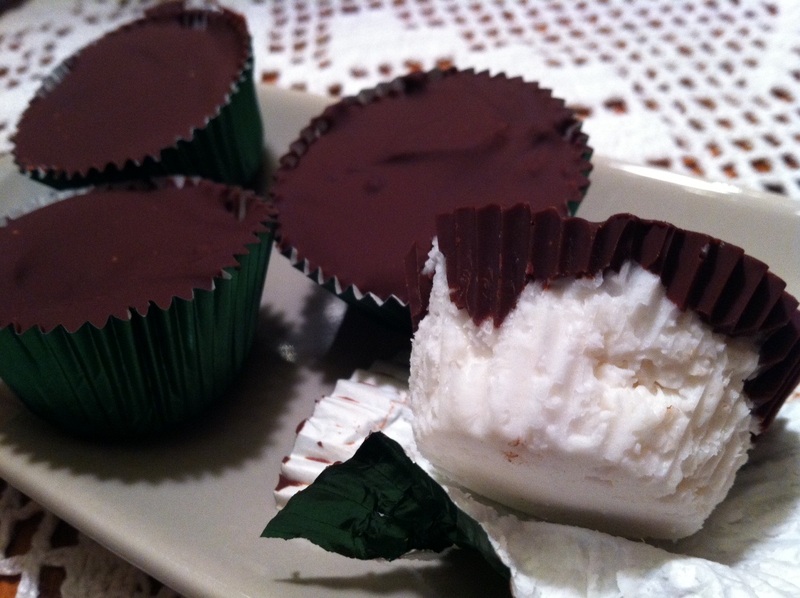 I wanted the other ingredients to be able to be tasted so I only used 1 tablespoon. It’s totally adaptable! And since you’ve gone to the trouble of making your own granola, why not make your own Vanilla Bean Yogurt to eat up with it? Mhmmm. Preheat your oven to 250 degrees. Line a rimmed baking sheet with parchment paper or a silpat mat. In a large bowl, add your oats, brown sugar, coconut, coconut oil, salt and cocoa powder. Stir to combine and no lumps remain. Pour your mixture onto your prepped baking sheet and place in your preheated oven. Bake for 1 hour, stirring oat mixture about every 15 minutes. Remove the pan from the oven and let cool for about 15 minutes. Add mixture to a large bowl, then add almonds and cherry craisins. Stir to combine. Once mixture has completely cooled, store in mason jars or other air tight containers and enjoy! Stored this way it should last you awhile. Exactly how long I have no idea because it doesn’t last long enough to go stale. This is fantastic on my Vanilla Bean Yogurt. I had a friend who enjoyed it on some vanilla bean ice cream as well. Or, you can just eat it straight out of the container. Whatever your heart desires!